“What's to prevent us from saying Hitler wasn't right? Sounds just like many modern atheists today. This quote is from Table Talk. 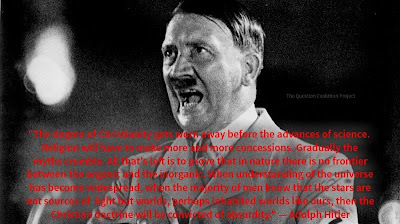 For some reason, many atheists want to "give" Adolph Hitler to Christianity. "Hitler was a Christian! ", they gloat. But that is the opposite of the truth. "He said he was a Christian, Cowboy Bob!" Ummm...yeah. How often do you believe politicians, especially those that have murdered millions of people and were obvious maniacs? Get that? He was a politician, striving for power. Also, who was Jesus to him, what was God, what was Christianity to him? The same problem exists with many atheists today — they redefine the terms to suit their own ends. I have some ideas on why Christophobes try to pretend that Hitler was a Christian. First, to make the atrocities of the greatest mass murderers of history, the atheists Mao, Stalin, Lenin, Pol Pot and so on, seem — well, not so bad, really. Second, it's one of the weird stretches of atheistic logic that I've encountered: "Hitler was a Christian, so Christianity is bad, so there is no God!" No, not in those words, but pretty doggone close. Third, it's motivated by hate, and they'll find any excuse, no matter how stupid and easily disproved, to say something bad about Christians. Here are some articles for your perusal. Take a special look at the dishonest comments by Fergus at the bottom of the article, and how he's soundly trounced at "Refutation of New Scientist’s Evolution: 24 myths and misconceptions — The Darwin–Hitler connection". Next, "Hitler Was Not a Christian: Refutation of Atheist Slander". After that, "Was Hitler a Christian?" Then you can read "Did Hitler Rewrite the Bible?" New: "The 'Hitler was a Christian' Mythos. If you have time for something even longer, go to "From Zeitgeist to Poltergeist - Responding to Richard Dawkins on the Issue of Atheism, Joseph Stalin, Adolf Hitler, Communism and Nazism"
You really should bookmark this page and share it with those people who show their ignorance and bigotry by saying that Hitler was a Christian.